Fireborn pottery may be used in a dishwasher, microwave and oven. Avoid sudden, extreme changes of temperature. You can place porcelain in a 325-degree oven and then increase the temperature. When you remove an item from the oven, place it on a pad of wood, cloth or cork, not on a cold tile counter top. 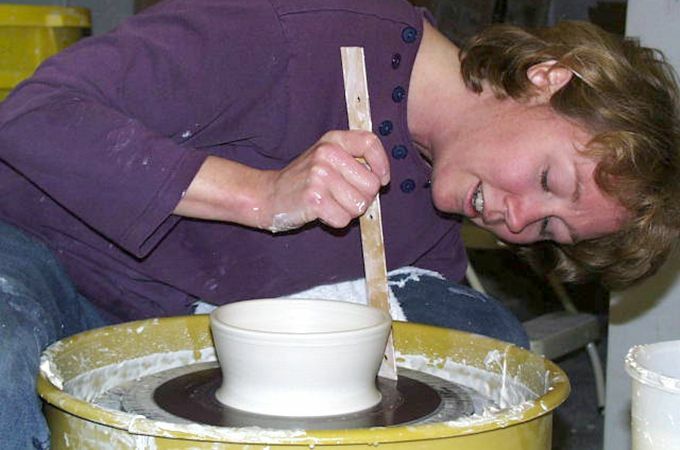 All our glazes and our clay are lead and cadmium-free. Glazes: At Fireborn Studios we formulate our own glazes. Sometimes we begin with with recipes from books of traditional glazes and then rework them to to meet our needs, sometimes we create glazes from scratch. We do thousands of glaze tests and experiments. We use a computer program called “Insight” to help with chemical analysis. See some of our glazes. Firing: We fire to cone 11 (2400 degrees F.) in a 100 cu. ft. gas kiln. Not many potters fire that hot in a gas kiln. The kiln is made of steel, and lined with firebrick and ceramic fiber. Ancient Chinese and Japanese kilns used wood. We use natural gas. But in both cases, the combustion process is similar, and uses carbon and oxygen. Combustion allows us to control the atmosphere in the kiln (unlike in electric kilns). We begin the firing in an oxidation atmosphere, and end in a reducing atmosphere, which promotes the development of certain colors such as the celadons and copper reds. To explain in more detail, during certain points in the firing we increase the gas and cut back on the air entering the kiln. This oxygen-deprived atmosphere is called a reducing atmosphere and it produces free carbon (visible as smoke). Then, hungry for oxygen, the fire breaks chemical bonds in the glazes to obtain oxygen. Chemical reactions strip oxygen from the glaze materials, especially the coloring oxides present in the glaze. These oxides are thus reduced to their metallic state. The intensity of the colors produced varies according to the percentages of oxides present, the character of the base glaze, and the amount of reduction. In reduction firing, such as I do, the firing of the kiln is as much an art as it is a science. Each glaze works best in a specific area of the kiln where there is a particular atmosphere and temperature. Visualize the flames in the kiln swirling around the pots. Just like in a campfire, the flames are constantly changing as they lick the pots. This firing process produces beautiful variations which add character and make each piece different. This is a list some of materials we use. Glaze base chemicals: silica (flint), kaolin clay, ball clay, red clay, bentonite clay, assorted soda and potash feldspars, Whiting (lime), Gerstley borate, nepheline syenite, dolomite, zinc and spodumene, talc, barium, soda ash, bone ash, and tin oxide, to name a few.